When I first heard that Glee’s Grant Gustin had landed the role of Barry Allen, the future Flash, I was a bit skeptical. It wasn’t because of his boyish looks, it was because I didn’t think he was that great of an actor after watching him play Sebastian Smythe, a thorn in New Directions side. However, after seeing him in tonight’s Arrow, I will admit that I was wrong to misjudge his acting talents. Gustin is absolutely perfect as Barry and his chemistry with Emily Bett Rickards as Felicity, is smoking and their banter is hilariously awkward and flirty at the same time. 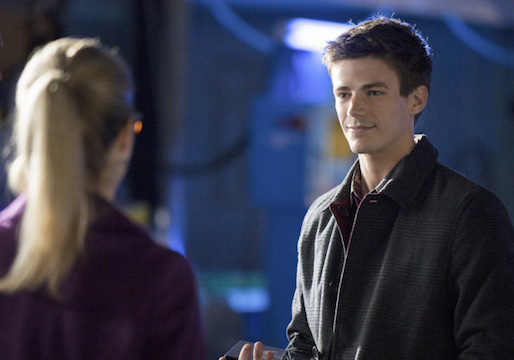 Everything changes in a flash is how the CW teased tonight’s episode of Arrow and they weren’t kidding. We not only meet Barry Allen (the future Flash) but we get introduced to some fantastical elements like the concept of a human with super strength and hightened senses. Anyways, there is a reason why Central City’s Barry Allen is visiting Starling City. He is investigating a crime/murder that opened the episode. As the show opened we see someone rob Queen Consolidated’s Applied Science division (the one that created the earthquake device used in the Undertaking). When Oliver, Diggle and Felicity go to investigate the scene not as Team Arrow but as Queen Consolidated CEO who brought his black driver and assistant along to see what happened. Starling City with Officer Lance on the scene thinks it is multiple people but Barry Allen saying that Central City has seen a similar case, was sent by his boss a Director Singh (who gets name checked later) to help out in his capacity as a CSI. Barry tells all present that it is one person who has tremendous strength that killed the security guards and stole one thing, a centrifuge. Lance suggests that Felicity get in contact with Arrow to investigate while Felicity tells him that she has a feeling that he is on it. It seems that Oliver has a feeling he knows what the centrifuge would be used for and when a blood bank got robbed by the same truck that was used to take away the centrifuge, Diggle really suspects that Oliver knows what is going on. However, when Oliver returns from his failed attempt at stomping the guy, he tells his Team Arrow that he has seen someone like that before during his time on the island and that he was able to stop the person and destroy all of the serum but he mentions how a person named Ivo was behind it then but not behind it now considering that he is dead. Of course, Oliver finding all of this out is thanks to the help of the new team of Barry and Felicity. They together work on investigating the case and get really close. The are incredibly cute together in how they are quite awkward with each other but you can tell that they are smitten. In one scene, Barry wants to know all about Arrow from Felicity and starts to make very close predictions about his especially how he got his training and that he has a team with one member that is good at computer science. Felicity wants to know his fascination with Arrow and he mentions how his mom was murdered when he was 11 and that the killer wasn’t caught. He believed that if the vigilante was around that he could have found the killer. Before I forget, The Central City S.T.A.R. Lab’s Particle Accelerator has another mention tonight but this time Barry seems excited at its opening. Another cute scene between Barry and Felicity involves Felicity asking Barry out to a Queen Consolidated shindig (more on that later) as her plus one after assuring him that she isn’t dating Oliver and in fact tells him she doesn’t like him (yeah right). He agrees but says he hopes there is no dancing cause he can’t dance. Oliver of course is wary of Barry and asks Diggle to dig into him (pun intended). The truth is that Barry’s boss, Director Singh, has no clue that he is Starling City investigating this. The reason being is that he wants to clear his father’s name in the murder of his mother. When he was 11, a blur came into his house but with that blur he saw someone. However, no one believed him as they think he was just defending his father. And that is the reason why he wants to investigate crimes that seem impossible. He wants to explain these in hopes of clearing his father’s name. Barry then turns down Felicity’s plus one and Oliver defends his actions saying that Barry lied to them but she retorts back that they lie too. At the Queen Mansion, Oliver is throwing a party for his mom as a welcome back. He thinks that this would be good for her and the company but Isabel thinks not and told him so when Moira first visited the office. Of course, the party is a bust with few people in attendance. However, to make amends to Felicity, Oliver called Barry, who shows up and the two share a really sweet dance. However, it seems their romance is stopping before it gets a chance to start as Barry is called back to Central City if he still wants to be employed. And just when you think the two will kiss, they instead share an awkward but cute goodbye. Speaking of Moira, she almost comes to blows with Isabel at the party but Oliver stops before a verbal cat fight could happen. Also, fallout from last episode’s bombshell rears its ugly head as Malcolm threatens Moira to get her to tell Thea that he is her father and wants Thea to come with him as she is the only family she has left. However, Moira doesn’t tell Thea the truth. In fact, she is through being afraid of Malcolm (who thinks he owns her considering he got her off all those murder charges) instead she threatens him with Ra’s Al Gul who has learned that Malcolm is alive and that the League of Assassins are none to please with him because of the Undertaking. She basically wants him to leave Thea alone and never set foot in her house again. Now onto Thea’s plot of the night. This involves her helping Sin and Roy finding her friend Max. When they visit his apartment, it is filled with drawings of Brother Blood’s mask. The corrupt cop sees that they are trying to find Max so Blood lets them find him. Sin and Roy find him dead. The police tell him that he OD but seeing blood come out of his eyes makes Roy think the opposite. He goes to tell Arrow what he found but Arrow wants him to stay away but Roy doesn’t and starts to go investigate himself but Arrow shoots him in the leg. We are led to believe that their partnership is over. Back to our central plot, Felicity has discovered where this man with super strength may be along with the blood and centrifuge. It is an ARGUS bunker. Arrow goes to confront him. A fight ensues but Cyrus uses his super strength to throw Arrow around and he ends up smashed into a crate of medical supplies and we his leg stuck with two syringes of unknown substance. When Felicity and Diggle come on the scene, they have no clue what he has been injected with. Diggle wants to call 911 but Felicity says not to as it will compromise his identity. Instead, we see that she has turned to Barry for help. As Barry waits for the next train to Central City (he just missed the last one of the night), he gets tranq and when he wakes, he sees that he is in the Arrow Cave and that Oliver is the vigilante and Felicity begs him to help her friend. The island flashback is pretty simple this week. It basically involves Oliver, Slade, Shado and Sara finding the Japanese sub and within it a miracle serum to cure Slade, who is dying from his injuries from the surprise attack a few episodes back. On their journey there, Oliver explains to Shado his soap opera-like relationship with Sara. They do make it to the sub and find the cure but don’t find the sedative that he needs so he won’t die when the serum is injected into him. Slade says that since he is dying anyways that Oliver should just inject the serum into him. He tells Shado is only regret is that he didn’t tell her how he really felt about her. Oliver then injects the serum and Slade starts to writhe in pain and blood starts to pour from his eyes, as we’ve seen in the present day with Brother Blood. He soon stops writhing and Sara determines that he is dead (but I highly doubt that). Oliver and Shado mourn but then Ivo and his men find the sub and it seems that our island gang have been captured. Next week is the mid-season finale and looks like the action won’t be slowing down anytime soon. Things of note: the base of the centrifuge looked an awful lot like Superman’s symbol and also is the best way to describe what Barry saw was as a blur and he even called it the Blur. When I hear that I think Smallville as that was what Clark was called before be became Superman. Anyways, here is hoping that the ratings for this episode and the next are sky high as I would definitely watch The Flash TV series. However, it should be noted that when Smallville introduced Aquaman way back in season 5, that episode was highly rated, which led the then WB to commission a Aquaman pilot but it never got picked up. Part of the reason could have been that they recasted Alan Ritchson with Justin Hartley. The pilot is available on Smallville’s Complete Series and while not great, it wasn’t bad either as it had some potential. But Aquaman’s loss was Smallville’s gain as Hartley went on to play that show’s Oliver Queen/Green Arrow.